Hankering after some good old British television? BritBox may be just what you need. These days, TV streaming services are ten-a-penny. 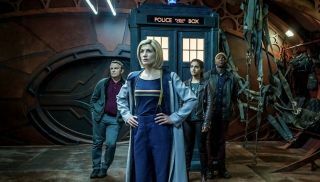 But if you’re after great British TV shows like Doctor Who, Agatha Christie's Poirot, or Coronation Street, you’re often limited to the few shows that are licensed to third-party platforms like Netflix or Amazon Prime Video. Enter BritBox: an online portal for British TV boxsets and original programming, bringing all sorts of modern and legacy TV content from the UK’s biggest broadcasters. Not quite a Netflix killer, but could certainly become a potential disruptor that brings together decades worth of beloved British television. Here we run you through what to expect from BritBox, what a subscription will cost, and why you might consider signing up for the service. BritBox aside, what is the best TV streaming service out there? The brainchild of two British broadcasters, ITV and the BBC, BritBox is an online, ad-free, subscription-based streaming service designed to export British programming beyond the UK’s shores – and soon in its UK homeland too. It’s no secret that viewing habits have been shifting online, with the rise of Netflix, Amazon Prime, Hulu and the like eating away at viewing numbers for traditional broadcasters. Both ITV and the BBC have their own online catch-up services already – ITV hub and BBC iPlayer – but joining forces for a larger online offering is likely the best way to ensure their long-term survival in a fiercely competitive online market. Though BritBox originally launched only in the US and Canada, we recently learned of plans to bring BritBox to UK viewers too. BBC and ITV are finalizing legal agreements for a UK version of the service to come this year, according to an announcement the BBC made in February. It’s not clear what this means for ITV Hub and iPlayer, though we could imagine the services being folded into the larger BritBox platform going forward. The announcement above also hinted that other UK broadcasters were likely to cooperate on Britbox in the future. It's worth noting that a similar project was shuttered by the UK's Competition Commission in 2008, after concerns of how powerful a combined streaming platform for the UK's major broadcasters would be. So for BritBox to come to the UK, there may be stipulations that it doesn't roll up too many catch-up services under one banner. So does my country get BritBox? If you’re reading this, probably! BritBox launched in the United States in 2017, and come to Canada the following year. As BritBox initially intended as a way to export British TV shows outside the country, it’s only now we’re hearing chatter of a BritBox platform in the UK – which is expected to launch in late 2019. We expect that BritBox will roll out to other territories in the future, to limit the BBC’s reliance on Netflix and competing streaming services to showcase their content globally. How do I access BritBox? For watching BritBox on a web browser, all you have to do is head to www.britbox.com. You’ll be invited to sign up for a seven-day free trial before payments start being taken monthly from your account (though so far only in the US and Canada). There’s also a dedicated BritBox app on Google Play and the App Store for streaming to your phone, tablet, or computer. You’ll find the BritBox app on Google Chromecast, Apple TV, or Roku streaming devices too. US subscribers to Amazon Prime Video can also subscribe to BritBox via Amazon Channels. How much does BritBox cost? US pricing for a BritBox subscription is $6.99 a month, around the cost of a Basic Netflix subscription. The UK service is expected to be priced “competitively”, which we imagine means a similar £6.99/m when it launches later this year. Paying for a TV license fee (as you would for BBC iPlayer) won't cover the subscription cost. What shows are actually on BritBox? BritBox combines the best of BBC and ITV programming, including staple soap operas, such as Coronation Street, Eastenders, Holby City and Casualty – new episodes of which appear on the service within 24 hours of initial broadcast. The real draw is legacy content on the service, with thousands of hours of television from British tentpole programmes like Gavin & Stacey, Poirot, Miss Marple, Fawlty Towers, The Office, and Absolutely Fabulous. BritBox also has hundreds of episodes of Doctor Who dating back to the 60s, for those of you not sated by recent seasons. The BBC’s Director General Tony Hall clarified BritBox wouldn’t replace iPlayer – the BBC’s online catch-up service, which is supported by a license fee rather than a monthly subscription – though there will undoubtedly be an overlap in the programming available. Should I sign up for BritBox? If you’re in the US and want a proper look at iconic British programming from over the years, BritBox is a relatively cheap subscription service with plenty to keep you busy. It doesn’t have the variety of Netflix or Amazon Prime Video, but you won’t get a similar concentration of British gems anywhere else. And if you’re in the UK? It’ll be hard to tell until the service launches this year and we can see how the content library differs from BBC iPlayer. But at first glance, it seems like a sensible proposition for viewers who don’t pay a license fee for terrestrial channels but don’t want to miss out on the best of the BBC and ITV’s programming.